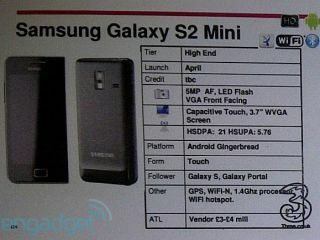 , Three's leaked slides also out the Samsung Galaxy S II Mini. The 'mini' version of the Samsung Galaxy S II comes with a 3.7-inch screen – not exactly what you'd call small given that it's the same size as the HTC Desire S's display. The processor isn't exactly tiny either, rocking 1.4Ghz as it does, plus there's Android Gingerbread and front- and rear-facing cameras to play with too. The latter comes in at 5MP with autofocus and an LED flash as standard. Three's slide lists the Samsung Galaxy S II Mini release date as April, which could see it putting in an appearance before its erstwhile brother, the Samsung Galaxy S II which some retailers have pushed back to May. Also getting a look in thanks to The Great Three Slide Leak of 2011 is the Nokia X7, of which we've heard hide nor hair since a sneaky video back in November 2010. The X6 refresh looks set to land in June running Symbian; which version hasn't been specified but we'd guess Symbian^3.